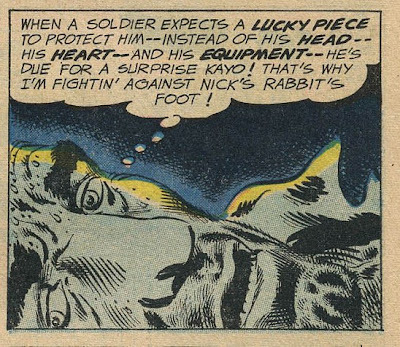 Comments: Excellent Bob Kanigher story with terrific art as usual by Kubert. 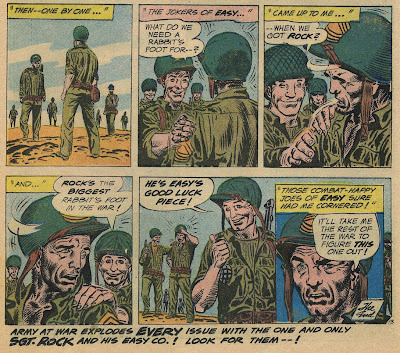 More than anything else, it's Kubert's inks that give his characters faces so much emotion. There is a short feature on the Fighting 41st infantry division, known as the Jungleers for their fighting in the South Pacific, followed by "Bait for a Desert Hawk". A German pilot and an American pilot find their fates tied to a battle between a falcon and a sparrow hawk. The German and the falcon win the first battle, but the American copies a trick used by the sparrow hawk in a rematch and is successful as well. 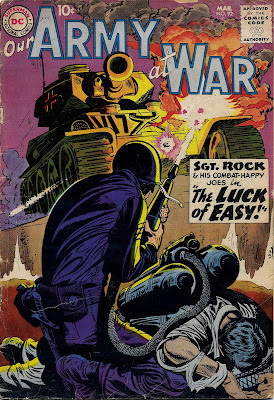 Comments: Nice compact (6 pages) story with art by Russ Heath. "D-Day Commandos" is the tale of a pre-invasion commando who is supposed to be guided to his target by three men of the Maquis. However, when he arrives at his first waypoint, he is startled to discover his guide is a boy. The lad turns out to be both brave and intelligent, saving the commando for the next waypoint. This time the person awaiting him is an old man, who again proves resourceful and courageous. Now it is up to the last guide, who is young and manly. And a Nazi intent on sabotaging the mission. The commando realizes that the young boy and the old man did their jobs, so he must do his by defeating the Nazi and blowing up the bridge to help the invasion forces. Comments: Terrific story, in the compact style of the Silver Age; all the action described above (and more) comes in six pages and only 33 panels. This is not the first time I have remarked on this, but when you look at the Silver Age DC they were miles ahead of Marvel in terms of their treatment of women. Are we seeing a trend here? I don't even know if Betty Ross had a job in the old Hulk stories; wasn't she more or less a housekeeper for her father? I left Aquaman out of the mix because for some odd reason his Silver Age adventures did not start with a romantic interest; it was not until Aquaman #11 that Mera appeared on the scene. 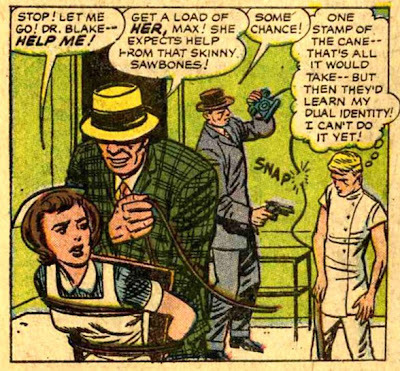 And you can make a case for talking about Sue Storm being a scientist, although it might help if Stan and Jack had shown her mixing up some chemicals in her spare time instead of trying on new clothes and hairstyles. Now it is not entirely fair to criticize this as sexist; it's also provides strong motivation for the hero. Hostages help balance out the power differences between superheroes and the (often non-super) villains. 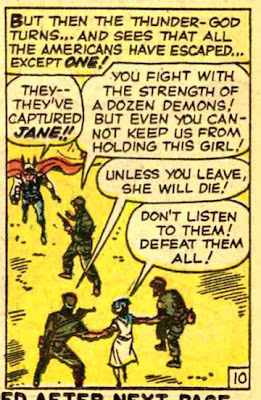 And it's not as if only women were used in this way; Jimmy Olsen and Robin often found themselves kidnapped as well. Sometimes even I'm surprised at what turns out to be well-grounded. I was reading Atom #10 (Dec 1963-Jan 1964). The second story in that issue is called The Mysterious Swan-Maiden, in which Jean Loring is required to act as defense counsel for a swan. The reader will see in this passage, as has been remarked already of the Roman law, that a distinction is taken between things which are capable of guilt and those which are not--between living and dead things; but he will also see that no difficulty was felt in treating animals as guilty. 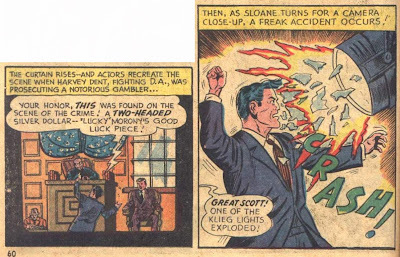 Gardner Fox (who wrote the story) obviously knew his legal precedents! 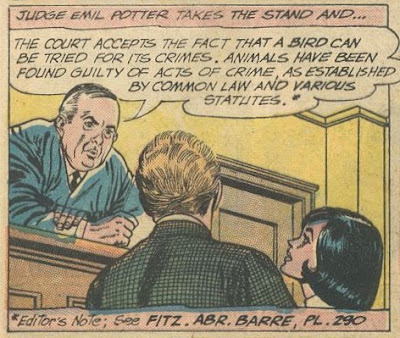 I should add that this discussion comes in a section on liability (i.e., torts), and that animals can not really be brought to criminal trial; that's a little bit of literary license. 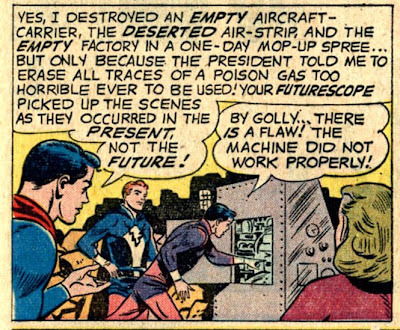 I've talked a number of times in the past about the weird scientific fascism that many DC comics of the Silver Age appeared to endorse, as well as the odd conflict between DC's apparent reverence for science and its decidedly ambivalent attitude towards the products of that science. 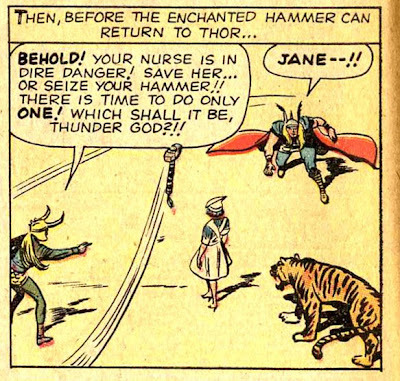 Here's another classic and bizarre example, from Adventure Comics #267 (Dec 1959). Just imagine the uproar if an administration tried to institute preventive detention, based on the fact that you're going to commit a crime five years hence. But, you know, it's just scientifically logical. Provided, of course, that the "futuroscope" works, which, of course it doesn't. Two-Face was one of Batman's better villains. Harvey Kent (later changed to Dent) was a handsome District Attorney in Gotham City, with a penchant for prosecuting mobsters. When he prosecuted Boss Maroni, the mobster scarred the left side of the DA's face with a vial of acid. 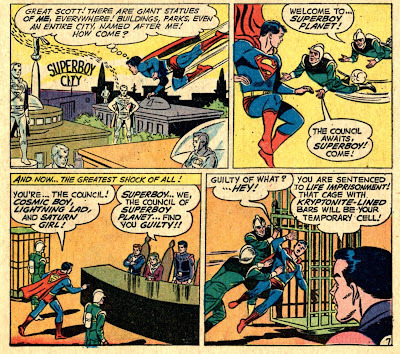 Driven mad by his sudden bizarre appearance, Kent became a lawbreaker, using the "two" theme in his crimes. In keeping with his dual nature, Two-Face had a silver dollar with two heads on it, one of which he disfigured. He would flip the coin and if the good side came up, he would donate the proceeds to a charity, blending in a little Robin Hood with the obvious Dr Jekyll and Mr Hyde characterization. But Kent eventually repented his evil ways and with the help of his fiancee and a plastic surgeon was able to resume his prior life. The saga was told over a series of stories appearing in Detective Comics #66, 68 and 80. Two-Face was clearly a popular character, and yet the editors seemed reluctant to disturb the happiness of the Kents. There was one story after those with Two-Face, but it turned out to be the Kents' butler, wearing a mask. Note also the black and white image as viewed from the TV in the original versus the color image in the latter; another difference between 1963 and 1950. I remember the first time I saw a color TV at about 1962 being completely blown away by the idea that they could improve on black and white. It turns out that the prop man had put acid in the bottle as revenge for Sloane stealing his girlfriend. 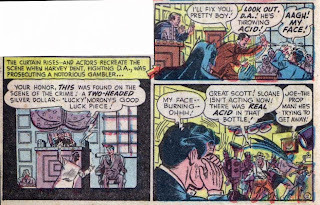 I suspect that the Comics Code Authority, while allowing the disfigurement to be presented, demanded that the love triangle be edited out of the scene when it was reprinted in Batman Annual #3.